On back of the push by GoI towards increasing internet penetration and faster adoption of digital payments, the flagship Unified Payments Interface (UPI) crossed total payment value of INR 1 trillion in December. 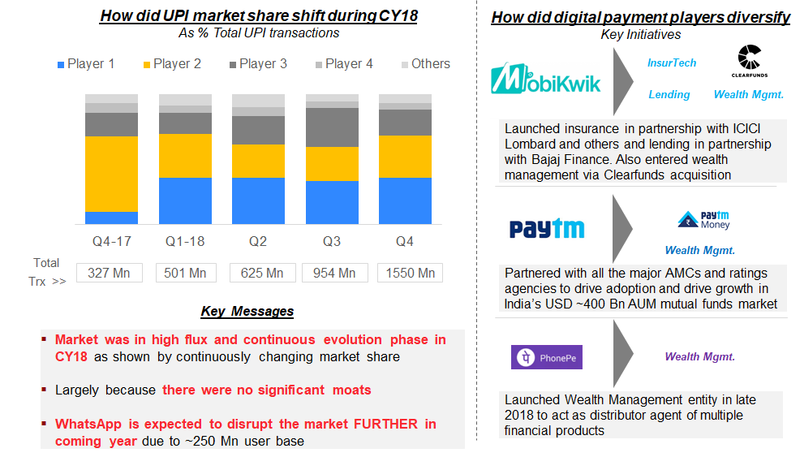 UPI has seen exponential growth in the past 12 months since they have expanded the user base due to ease of usage (accessibility without internet) and better economics. Further continued discounting and cash backs offered to consumers by incumbents have fuelled customer adoption. Share of wallets has fallen over the past 3 months. Earlier a major chunk of UPItransactions was P2P, but with coming of UPI 2.0, various banks and merchants are also pursuing to increase their share of UPI transactions which is being reflected in the higher Average Transaction Value for UPI (~INR 1630) in comparison to online wallets. (~INR 220). 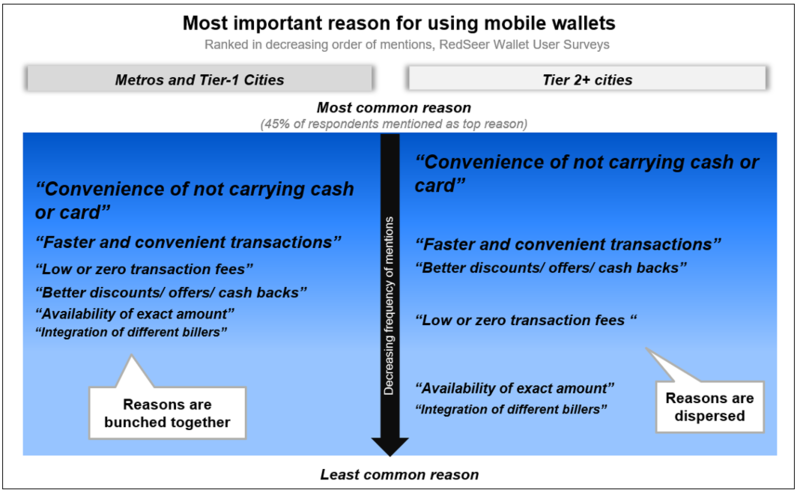 Per RedSeer research on mobile wallet users across city tiers, differences emerge between the value propositions sought by wallet users in these geographies- users in Metros/Tier 1s use wallets for broadly similar reasons (as the close clustering of reasons indicate), while customers in smaller cities have widely varying reasons for wallet usage (as the wide dispersion in the reasons indicates). What does this mean? 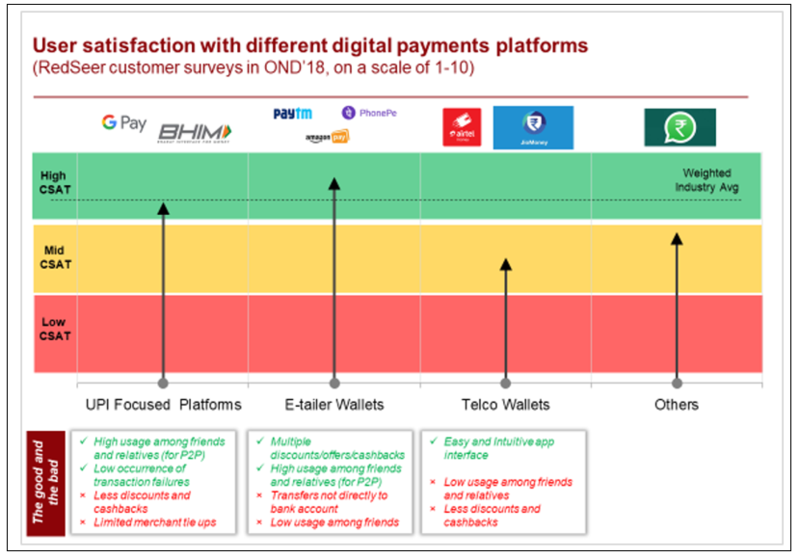 This finding has important implications for wallet players- most importantly around deep-segmentation and understanding of Tier 2+ customers, identifying their top user cohorts and building some level of customized value propositions for these cohorts at all stages of the customer journey from choice of marketing campaign to the product experience itself. Rather than having a one size fits all offering as has been done for Metro consumers (and which has worked well thus far). Interestingly, Tier 2+ wallet users are even more of convenience seekers, contrary to the stereotypes typically associated with them. And cashbacks are not reported in the Top 2 reasons for using wallets for this cohort, just like their metro brethren. Although the wallet companies spending heavily on cashbacks would beg to disagree with the prior statement. 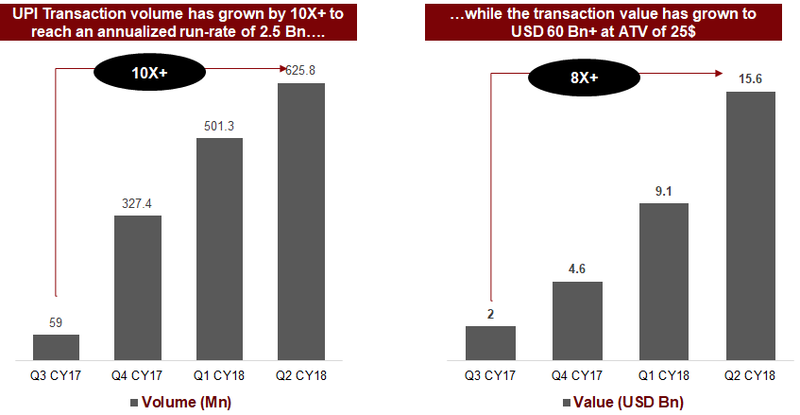 P2P transactions are the largest part of the wallets/UPI market, driving upto ~70% of its total GMV. No wonder then, that customer’s rate their wallet usage experience basis the experience of conducting P2P. For e.g. low usage of a certain wallet amongst the peer network leads to less opportunities for P2P, thus driving down satisfaction. Additionally, low cashbacks is one of the major reasons for pulling down usage satisfaction scores of a wallet. At the same time, the alert reader would note that cashback was not mentioned as the ‘core value proposition sought from wallet’ in the previous story. How does one reconcile these contradictory facts? One way to think about this is that probably users have got so used to cashbacks that they consider it a ‘hygiene factor’ rather than a ‘core value proposition’. Which has tough implications for the wallet platform’s bottom lines. No wonder then, that they are looking to expand into other fintech businesses, like digital lending for example. Digital Lending- Ready to realize its high potential? The digital lending sector has always been mentioned as one with high potential. A back of the envelope calculation shows that the 60Mn MSMEs in India are an addressable market of easily USD 200+ Bn in loans (highly conservative estimate). Even if one counts the digitally savvy SMEs, the figure for opportunity size doesn’t fall below USD 20-30 Bn, a huge market indeed. And a market which has gained the attention of the wallet players as well, seeking to boost their margins. Yet in our work with both MSMEs as well as market participants and investors, it has always surprised us why the digital lending sector has not yet been able to realize this massive potential. And we also were curious to ask certain questions about the market- which business models are likely to do well? How important are marketplaces themselves in this whole game? What will it take for the sector to reach an inflexion point? 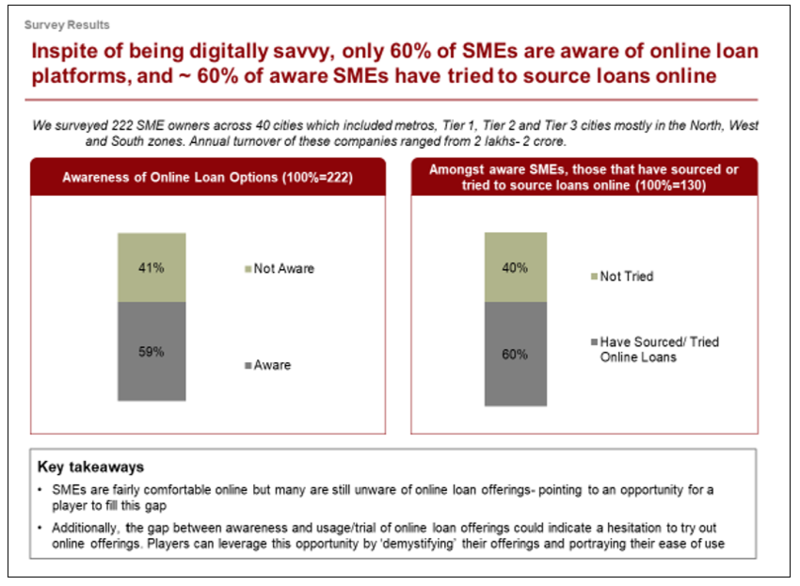 So fast forward to the present, what do these findings mean for digital lending players? For one, it makes it clear that traction can be gained by driving awareness and improved user experience. With rapid growth of marketplaces across sectors e.g. travel, restaurants, hotels, and e-tail, partnership models with marketplaces have been successfully used by a variety of players like Indifi, NeoGrowth etc. for building awareness and driving loan origination in last couple of years. Additionally, a mix of hybrid online and offline delivery which has been scaled by various players in last couple of years, could hold the key to driving improvement in the application process experience for MSMEs, which could catalyze further adoption. It is still early days for the market, and we expect a lot of innovation in both marketing as well as delivery to continue, even as the addressable market continues to remain huge. 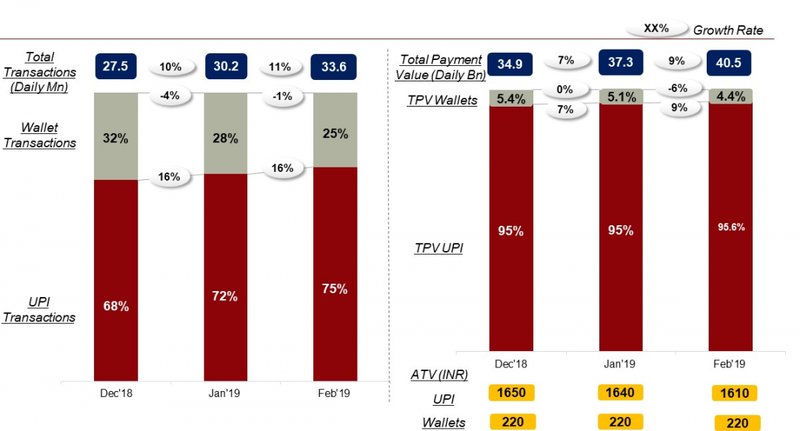 When it comes to the digital payment businesses the growth during the past couple of quarters has predominantly being driven by UPI. The share of UPI being ~1% during CY 17 and we expect to see a higher share by the end of 2018. Google Tez has disrupted the wallets market. With increase in monthly transactions from 13 mn in Sep-17 to 93 mn in Dec-17, Tez has witnessed phenomenal growth. It has already surpassed Paytm in the transaction value and will soon touch it in transaction volume. This is a new dimension in the tussle of wallets industry which has been largely dominated by Paytm. Demonetization had forced huge swathes of consumers to quickly adapt to the digital wallets lifestyle. But post re-monetization, consumers are back to their beloved cash- as indicated by a fall in average wallet balance as well as average # of wallet transactions per month per consumer. Yet, it is not all bad news, as indicated by the continued high willingness of merchants to accept wallet payments. Will the children of demonetization stick around? 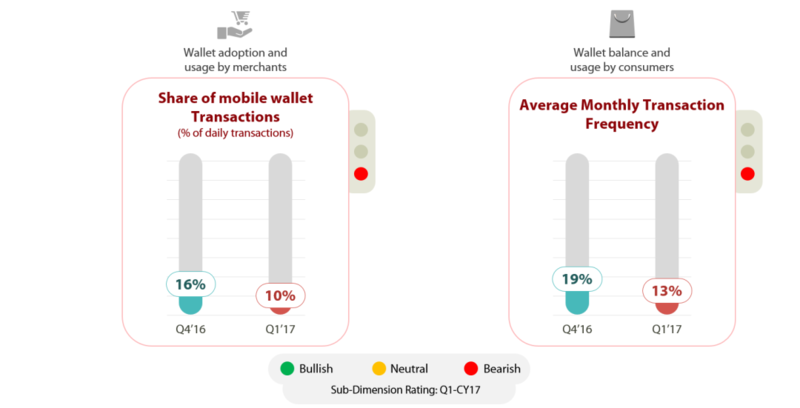 Demonetization in November spurred greater wallet adoption from both customers and merchants: RedSeer research shows that amongst offline, small-time merchants, only 55% of currently active merchants were actively accepting wallets before demonetization, with the rest joining the bandwagon post-Nov 2016. Amongst customers, 36% of currently active customers reported becoming active only post demonetization. 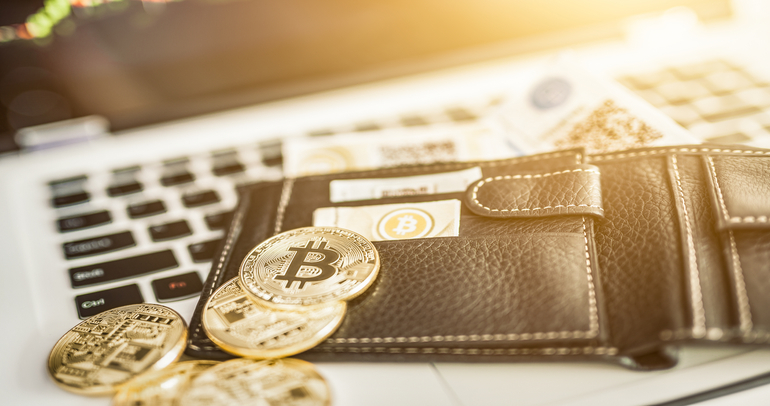 However, wallet players need to significantly upgrade user experience to ensure long-term stickiness: RedSeer research throws up significant user experience gaps with wallet usage, for both customers and merchants. While customers are unhappy with the poor ease of wallet usage and the low cashbacks on offer, pain areas for merchants include the high commission rates, poor merchant support and slow app UIs. Players need to rapidly resolve these issues to prevent a movement of users to other fast evolving platforms like bank wallets.